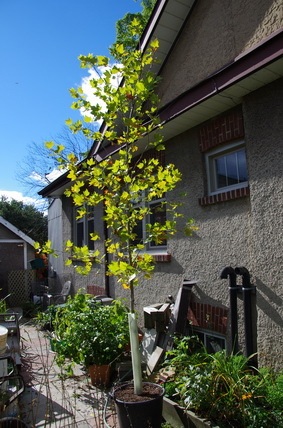 Dallying In The Dirt, Issue #191 --- The Platanus acerfolia has a new home. 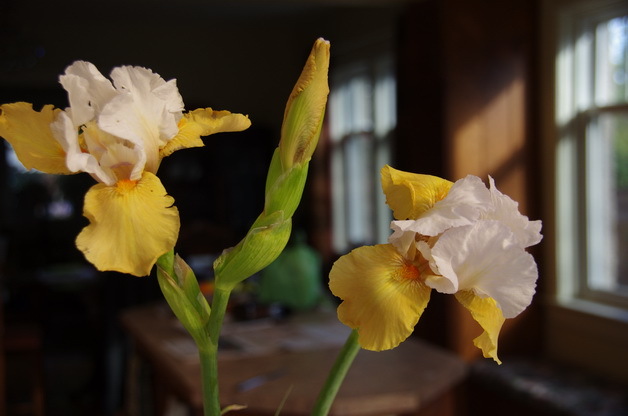 Finally after, at least 25 years of trying, I have achieved the reblooming Iris. I have purchased countless Iris that are said to be consistent rebloomers and have always been disappointed. There is one at the front corner of the yard that has put up a bloom stalk the last couple of years but it has always been to late and gets frozen before it ever opens. I was walking in the garden this week and went around behind the garage and stopped in my tracks to admire the two stalks, both of which had open blooms on them. I quickly cut them and brought them into the house to see if the Assistant Gardener would share my surprise and delight. She allowed as how they were very nice. They had escaped my attention because I had been away from the garden for a week. It was sunny and warm on the west coast and the three granddaughters were a delight to spend time with. The Assistant Gardener do did an admirable job of keeping things watered and now the cuttings in the basement propagation bed are already rooted and I’ll try to find time this week to pot them up. It’s going to grow at least 15 M (50ft) tall and have a spread approaching 10 M (32 ft.) If it is going to cover that much area, how can we spend an hour or more deciding on where to plant it. It’s our new tree and we know it’s going behind the berm to provide deep shade to that newly renovated space. The silly decision process was not about its general location, that’s why we bought it but rather, should it be 30 cm that way maybe the other way. The London Plane Tree, Platanus acerifolia has now been planted and it looks lovely and its final location was determined by where I could easily dig a hole, avoiding the large roots left behind by the recently departed Manitoba Maple, a weed tree if there ever was one. It has interesting light gray bark that peels off in thin layers giving it a most interesting mottled appearance. The leaves look somewhat like Maple leaves and it is very tolerant of pollution and compacted soil making it a great city street tree. It shouldn’t have to put up with much of that in our location. Even at the bottom of the planting hole there was lovely rich soil, the result of years of leaves and other vegetation piling up and decomposing there. I hope to turn the space underneath it into a woodland garden with Trillium and similar native species and minimal maintenance. The vegetable garden is rapidly becoming a giant compost as the summer plants finish their life cycle and hang their waiting for me to clean them up. The autumn vegetables such as Brussels Sprout and Rutabaga are looking good and we continue to dig up and enjoy the bright orange carrots. The surprise out there this week is one of the Zucchini plants. 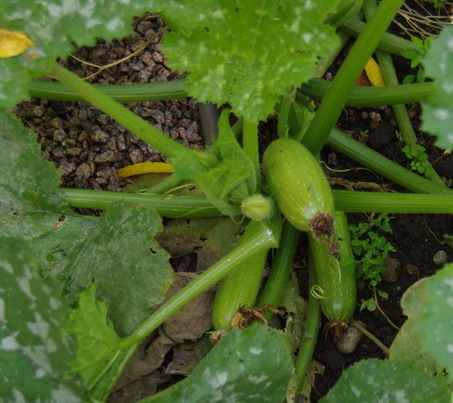 Most of them have surrendered to the powdery mildew by now but along the edge of the path in the back corner, I discovered a bunch of fresh green leaves and underneath them a lovely group of small fresh Zucchini growing. One of those will be on the dinner table tonight. Grilled, with a light coating of curry paste it will make a tasty addition to the menu. The Climbing Zucchini is still climbing and producing as well but that usually happens until a hard frost knocks it down. These little gems were a truly unexpected delight to find. Susann Asks? Can I plant perennial seeds right now like Holly Hock and balloon flower? Do you have to let canna lily's get frosted before you dig them up? Do Astrantia bulbs flower the first year they're planted? Mine didn't. Also do I need to take them in for the winter? Ken Answers! It's too early to start perennials like balloon flower indoors but some people seed them in pots that they sink into the soil outdoors in a protected location. That takes care of any need for a cold period that some perennials might have. Hollyhocks are actually a biennial, leaves the first year and flowers the second. Start them indoors mid Feb. Your Cannas do not have to be frosted, it's just that most of us are procrastinators and don't dig them up until we have to. Astrantia is hardy to USDA zone 3 or Canadian zone 4 and should bloom well next year. Dan Asks? Last year I wintered over a elephant ear plant. I took cut it back after a few cold evenings (mid October) put it in the basement and covered it till April a that time I moistened the soil and in early May it started to sprout. What started out as a single bulb is know approximately 12. The stems on the plant did not reach the height of last year. Question: I'm planning on wintering the over again this year using the same technique that I used last year. When and how should thin out the additional bulbs and will this allow the plant to grow to the original height. Ken Answers! I overwinter mine as bulbs quite successfully. The green ones do much better than the dark leaves ones. After they come in, I cut them back and then dig the bulb out of the soil, if they were in pots, and let it dry.Some of mine are planted into the garden and get dug up to come in. At that point I remove all of the dried foliage and separate the new bulbs. I repot and water about mid March so that I have nice sized plants,I pot up the new small bulbs as well, to put out in May. They will always try to put out new bulbs each year and their mature size is more a function of weather and nutrition than anything else. They are tropical and don't appreciate cool summers, which you can do nothing about.